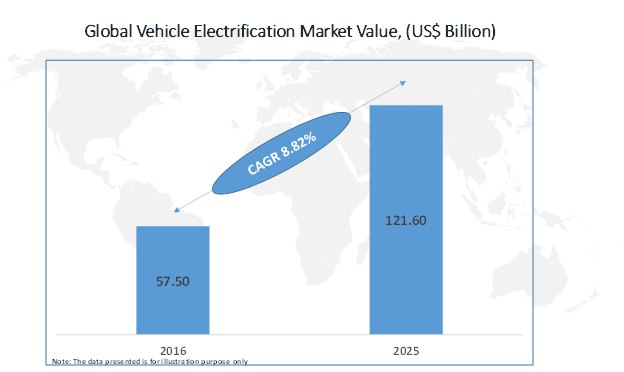 Global vehicle electrification market was valued at US$ 57.50 billion in 2016, is projected to exhibit a CAGR of 8.82% over the forecast period (2017–2025), to be valued at US$ 121.60 billion by 2025. Requirement to improve automotive fuel economy by replacing the mechanical linkages with electrical or electronic components is among the major trend that has gained traction in the automotive sector. These automotive functions includes the starters, steering, vacuum pumps, oil pumps, braking systems, and water pumps among others. This will fuel the growth of global vehicle electrification market over the forecast period. According to the U.S. Environmental Protection Agency (EPA), around 27% of the U.S. greenhouse gas emissions (GHG) is from the automotive sector. Increased adoption of private transportation and the growing requirement to improve the public transportation has led to increased concerns for the GHG emissions. Growing stringency of regulations concerning the emission and fuel economy standards in conjunction with the incentivization and other amendments to support the proliferation of electrical vehicles in the consumer markets are expected to fuel the global vehicle electrification market. For instance, Energy Efficiency and Conservation Authority (EECA) in New Zealand states that EVs are exempt from Road User Charges (RUC) until the 2020 which is valued over US$ 491 annually for 14,000 kilometers. European emission standards by European Council and U.S. federal emission standards by EPA are among the major regulatory guidelines fueling the demands for increased fuel efficiency. Requirement to meet these economy standards will fuel the growth of vehicle electrification market. Actuators control a mechanism or system, which operates on receiving an input signal in the form of current, voltage, hydraulic pressure, pneumatic pressure or human input. These are extensively used for functionalities that include climate control, transmission, engine cooling, and headlights for enhancing the user comfort. Utilization of other electronic technologies that include brakes, vacuum, axles, and boosters, among others substantially enhance the user convenience and automotive efficiency. This in turn has led to increased consumer inclination towards adoption of these features propelling the growth of the global vehicle electrification market. Asia Pacific vehicle electrification market dominated the global industry, is expected to continue its dominance over the forecast period, chiefly owing to the presence of some of the world’s largest manufacturing and sales hubs in the region. According to Coherent Market Insights analysis, motor vehicles production of the countries that include China, India, Japan, South Korea, and Thailand accounted for over 50% of the global production. Moreover, high inclination of consumers towards better comfort offered by vehicle electrification technologies, is expected to provide consistent demands in the developed economies of Europe and North America. Electric power steering (EPS) was the largest product segment by value in 2016, predominantly owing to its less complicated installation, compact space requirements, and high durability. Moreover, these are incorporated with sensors that sense the vehicle speeds and respond accordingly, that in turn improves the user safety. Based on degree of hybridization, Micro-Hybrid Vehicle and Internal Combustion Engine (ICE) dominated the industry share, are expected to dominate the industry share over the next following years, owing to the highest adoption of these vehicles across the globe. Key players in the vehicle electrification market include Aisin Seiki Co. Ltd., Borgwarner Inc., Continental AG, Delphi Automotive PLC, Denso Corporation, Hitachi Automotive Systems Ltd., Johnson Controls Inc., Johnson Electric, Jtekt Corporation, Magna International Inc., Mitsubishi Electric Corporation, Robert Bosch GmbH, Valeo SA, Wabco Holdings Inc., and ZF Friedrichshafen AG. *Browse 60 market data tables and 40 figures on " Vehicle Electrification Market - Global forecast to 2025”.